Curry leaves (கறிவேப்பிலை) are essential part of Indian cuisine. Though they are often used as seasoning and flavoring agents, curry leaves can be used to make mixed rice, chutney, kuzhambu and masala powder. Curry leaves are rich in calcium and vitamin A. They are used in Ayurveda for their anti-diabetic properties. Method: Wash the curry leaves well, drain and keep aside. Heat 1 teaspoon oil in a kadai, add red chiilies and fry till they turn dark in color. Then add urad dhal and Bengal gram dhall and fry till the dhals turn reddish brown in color. Switch off the fire. Add curry leaves to the kadai and toss with fried ingredients a few times. Grind coconut, fried ingredients, tamarind, curry leaves, pepper and salt with required water to a fine paste. Heat oil in a tadka pan or spice pan (தாளிக்கிற கரண்டி), add mustard seeds and once they start to sputter, switch off the fire. Add the seasoning to the ground chutney. Serve with idly, dosa, adai, appam, kuzhi paniyaram or uppuma. Note: If you use pepper corns, reduce the number of chillies. You may also prepare this chutney without coconut. 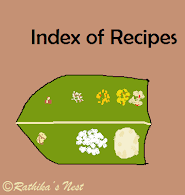 Double the quantity of curry leaves, and omit coconut, while rest of the ingredients remain the same. Grind the ingredients with little water into a thick paste, which can be stored for a few days. Plain curry leaves chutney goes well with curd rice.